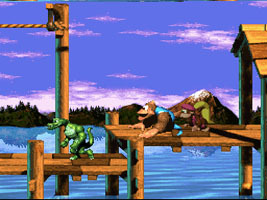 When DK and Diddy Kong disappear on an adventure in the Northern Kremisphere, Dixie Kong sets out to find them. It turns out the area is crawling with Kremlings under a new ruler named KAOS. Dixie is joined by her cousin Kiddy Kong on an adventure in a new land. Dixie and Kiddy have different physical traits: Dixie can hover with her ponytail, and she is small and light, while Kiddy is larger and stronger, which is useful for tackling enemies and breaking open cracks. They can also carry and throw each other into hard-to reach areas. Along with the Kong family, you will also meet the Brothers Bear and the Banana Birds who will help you on your travels if you help them out. 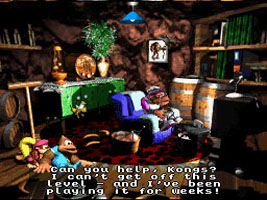 Wrinkly Kong has a Nintendo 64 in her save cave. The Nintendo 64 had been released just a few months earlier in Japan and the U.S. Sometimes when you visit, she will be playing the N64, and the music in her Save Cave changes to the music from Peach's Castle in Super Mario 64. "Are you sure? Some cheeky lad called Link was in just last week and he asked about the castle too. He didn't have enough coins, but he seemed such a nice fellow that I agreed to accept 500 rupees instead. After that he left… muttering about my shells being the wrong shape or something. Oh well!" This refers to Link from The Legend of Zelda series. The reference to the seashells may be referring to the seashells in The Legend of Zelda: Link's Awakening. The Brothers Bear named Benny and Björn are a reference to Benny Andersson and Björn Ulveaus, the male members of pop group ABBA. Incidentally, Björn is also the Swedish word for Bear.